The global viral vector & plasmid DNA manufacturing market is expected to reach a value of above US$ 2 Bn by the end of 2027, expanding at a high double digit CAGR during the forecast period. Increase in prevalence and incidence rates of cancer, genetic disorders and infectious diseases, high unmet needs in patients with rare disorders, and raised acceptance for comparatively newer treatment options in developing countries are expected to boost the viral vector & plasmid DNA manufacturing market during the forecast period. According to Cancer Research UK, there were 17 million new cases of cancer in 2018 and four most common types of cancer worldwide are breast, lung, bowel, and prostate cancers, which account for approximately 43% of all new cases. The global viral vector & plasmid DNA manufacturing market has been segmented based on type, application, disease, end-user, and region. In terms of type, the global market has been classified into lentivirus, adenovirus, adeno-associated virus (AAV), plasmid DNA, and others. The plasmid DNA segment dominates the viral vector & plasmid DNA manufacturing market, in terms of value. Increasing acceptance of viral vector-based advanced treatments is likely to drive the segment. The adeno-associated virus (AAV) segment is also expected to expand at a significant CAGR during the forecast period. This is primarily attributed to the wide use of AAV as vector of choice in variety of clinical trials ongoing worldwide. In terms of application, the global market has been classified into gene therapy, vaccinology, and others. The gene therapy segment dominates the viral vector & plasmid DNA manufacturing market, in terms of value. This is primarily attributed to the increasing acceptance of gene therapy products for the treatment of rare disorders across the globe and availability of approved gene therapy products. The vaccinology segment is expected to expand at a significant CAGR during the forecast period. The expansion is attributed to the increased research initiatives for viral vector based vaccines. In terms of disease, the global market has been divided into genetic disorders, cancer, infectious disease, and others. The cancer segment dominates the viral vector & plasmid DNA manufacturing market, in terms of value. This is primarily attributed to aggressive research initiatives based on viral vector based products for the treatment of variety of cancer. The genetic disorders segment is expected to expand at a significant CAGR during the forecast period. In terms of end-user, the viral vector & plasmid DNA manufacturing market has been segregated into biotech companies and research institutes. The biotech companies segment held a major share of the market, followed by the research institutes segment, in 2018. The biotech companies segment is expected to maintain its market share during the forecast period, due to increased demand for large-scale production of viral vectors and plasmid DNA for commercial use. In terms of region, the viral vector & plasmid DNA manufacturing market has been segmented into North America, Europe, Asia Pacific, Latin America, and Middle East & Africa. 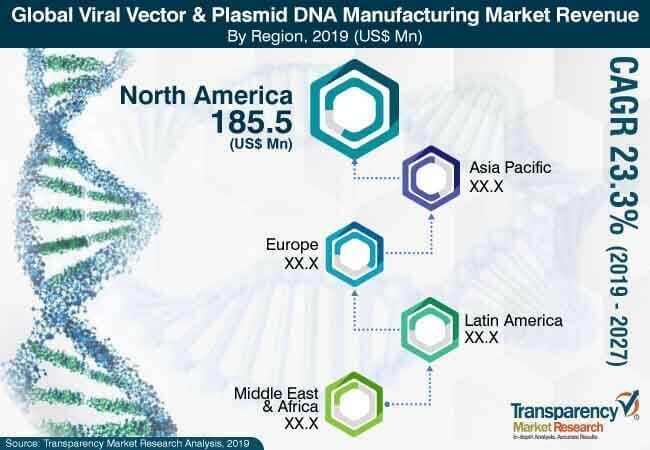 North America dominates the global viral vector & plasmid DNA manufacturing market, owing to the high acceptance of viral vector-based products in the U.S., increased prevalence of cancer and monogenic disorders, rich product pipeline, and technological advancements in the region. The market in Asia Pacific is anticipated expand at a considerably high CAGR during the forecast period, owing to the increased research initiatives in countries such as India and availability of approved gene therapies based on viral vectors in countries such as China and Japan. Major players operating in the viral vector & plasmid DNA manufacturing market include CobraBiologics, Novasep Inc., Cell and Gene Therapy Catapult, Kaneka Eurogentec S.A., FUJIFILM Diosynth Biotechnologies Inc., Spark Therapeutics, Inc. Merck KGaA, uniQure N.V., and Lonza. Key players are expanding their product portfolios through mergers & acquisitions and partnerships & collaborations with leading pharmaceutical companies, which is expected to increase product availability, and thereby boost the market. The viral vector & plasmid DNA manufacturing market report comprises an elaborate executive summary, including a snapshot that provides information on various segments of the market. It also provides information and data analysis of the global market with respect to segments based on type, application, disease, end-user, and region. A detailed qualitative analysis of drivers, restraints, and opportunities of the market has been provided in the market overview section. Additionally, the section comprises competitive matrix and profiles of key market players, along with business overview, to project the competitive landscape of the market. The section also provides market attractiveness analysis based on region and market share analysis in terms of key players, thereby presenting a thorough analysis of the overall competitive scenario in the viral vector & plasmid DNA manufacturing market. Based on type, the global viral vector & plasmid DNA manufacturing market has been segmented into lentivirus, adenovirus, adeno-Associated Virus (AAV), plasmid DNA, and others. In terms of application, the global viral vector & plasmid DNA manufacturing market has been divided into gene therapy, vaccinology, and others. Based on disease, the market has been segregated into genetic disorders, cancer, infectious disease, and others. In terms of end-user, the market has been bifurcated into biotech companies and research institutes. The market size and forecast for each of these segments have been provided for the period 2019 to 2027, along with their respective CAGR for the forecast period 2017 to 2027, considering 2018 as the base year. In terms of region, the global viral vector & plasmid DNA manufacturing market has been segmented into five major regions: North America (the U.S. and Canada), Europe (the U.K., Germany, France, Spain, Italy, and Rest of Europe), Asia Pacific (India, China, Japan, Australia & New Zealand, and Rest of Asia Pacific), Latin America (Brazil, Mexico, and Rest of Latin America), and Middle East & Africa (South Africa, GCC Countries, and Rest of Middle East & Africa). Market size and forecast for each of these regions and the mentioned countries have been provided for the period 2019 to 2027, along with their respective CAGR for the forecast period 2017 to 2027, considering 2018 as the base year. The research study also covers the competitive scenario in these regions.